Fear is something that is hard to resolve. Dealing with human fear is one thing, but dealing with a fearful dog is another. Noise phobia is quite common among dogs. The most common causes of this phobia include loud environmental noises such as fireworks, gunshots, or other sudden loud noises. Fireworks during holidays or fanfares usually make dogs scared. This is quite a natural reaction among dogs. The bright flashes of lights from fireworks could surprise them and cause them to be frightened. The excessive noise could be painful to their sensitive ears. Scared dogs have a variety of reactions. They can start pacing around, chew a lot, keep digging, or drool. Others seek out their owner and jump on their laps for comfort. These are just a few of the reactions that are triggered by fireworks. However, other reactions could cause injury to your dogs. If they jump through glass doors or other things in order to escape that could hurt them. A more frightening reaction is when they will run off to a road - they could get hit by a vehicle. It is therefore very important to address this noise phobia to prevent accidents like this. 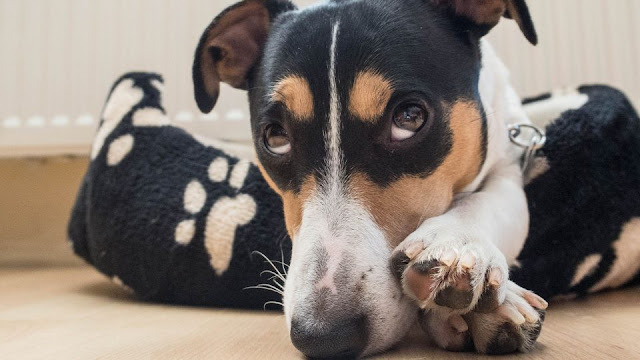 If your dog has a noise phobia, don't worry about it just yet. Although you cannot totally remove the fear, there are a lot of things that you can do to minimize the fear. It just takes a bit of training and a lot of patience in order to see changes from your dog's fearful behavior. The following should help guide you as you begin to understand how you can help control your dog's fear of fireworks. Keep in mind though that these different ways can vary in effectiveness. The first thing would be training. You should address your dog's frightened behavior and take steps to start behavior modification. It is very important to keep in mind that cuddling or babying your dog should be avoided when he tries to seek you when he is scared. Doing so will only encourage the behavior. One way is through desensitization. This is done by slowly exposing your dog to fireworks and other noises that he is afraid of, starting from low exposure then gradually working your way up until he no longer shows any fearful behavior. You can play an audio or video of fireworks a couple of times per day with a low volume. Increase the volume the next few days until your dog is little or no longer affected by the sound of fireworks. Another method is counter conditioning. This is achieved by associating the fireworks with things that your dog loves. You can give your dog treats, his favorite toy, or any activity just before the fireworks and right after. Over time, your dog will associate the fireworks with positive experiences and will be undisturbed by future situations. Crating is also another thing that you can do during a fireworks display. Place your dog in a crate and cover it to make a "den". Dogs feel much safer in dens. using body wraps or Pressure wraps prove to help ease frightened dogs too. If you don't have one, you can also use a shirt that hugs your dog's body. But as much as possible, try to avoid taking your dog during fireworks display or fanfares. That way, you'll be sure that your dog doesn't have to go through an anxiety-causing experience.